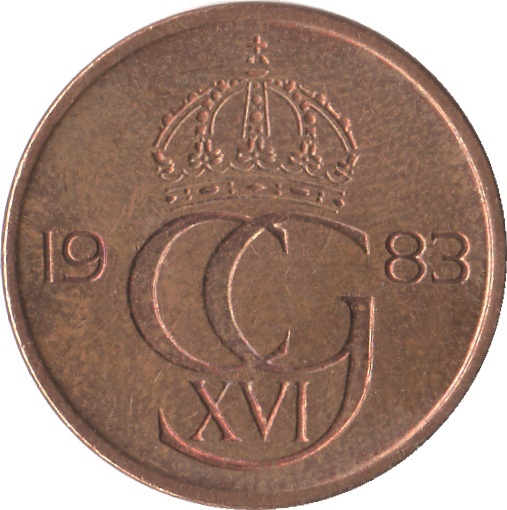 Crowned Carl XVI Gustaf monogram divides date at sides. Lars Englund (born May 6, 1933 in Stockholm) is a Swedish sculptor and painter active since 1953. 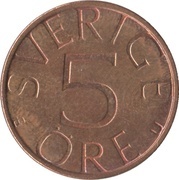 On the reverse is the figure 5. Above the figure is the text SVERIGE and below is the text ÖRE. Left of ÖRE is the mintmark while at right there is the first letter in the surname of the Governor of the Riksbank.